Since 1968, FirstFruits Farms is one of the largest apple orchards in the state with more than 6,000 acres producing about 17 varieties of apples, pears and some cherries. Based on the founding dream to help those in need, a portion of our profits go to support our employees in the form of youth programs, housing and leadership training. Our commitment to providing real opportunities for their employees fosters a workforce dedicated to growing and packing the very best apples in Washington. 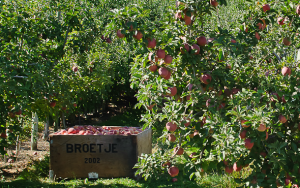 We are committed to making sure that every acre of the orchard contributes positively to our people and the planet through the use of sustainable farming methods and investment in the success of each employee. And because we pick, pack and ship right on site, the fruit travels less – reducing fuel costs and damage to the fruit. 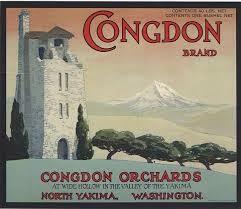 Congdon Orchards was established in 1895 when founder Chester Congdon completed the canal delivering water from the Naches River to a parcel of land known as Wide Hollow. Multi-generational farming has helped Congdon Farm keep its history alive for future generations. Covering over 1,500 acres of land with an average of 290 sunny days a year, the valley where the farm is located provides favorable conditions for producing luscious, satisfying fruit. Congdon Farms believes in developing new ways to surprise the public’s palate, while helping its customers do business more efficiently and profitably – values consistent with Chester Congdon’s vision.